Here’s a great way to make a standard bouquet of flowers go a long way with several arrangements. Small delicate flower varieties along with wild flowers look so charming arranged inside vintage looking pastel coloured egg holders which may not be getting a great deal of use in your new home. 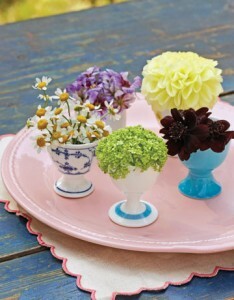 What a way to reclaim your kitchen cast offs and use them as the focal point for these precious looking floral arrangements. 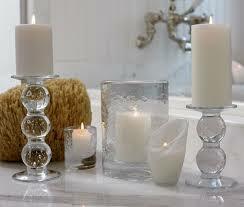 Lighting candles in your guest bathroom or powder room is great way to set a nice ambiance. If you have scented candles, even better! 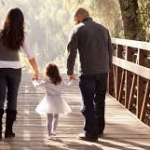 Make guests in your new home feel special by letting them know you’ve looked after even the smallest of details. Be sure to leave the lights on though, you don’t want your guests to think you’re using candles to save power! 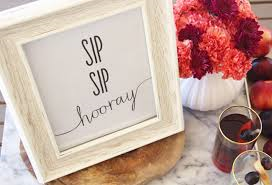 Use an existing picture frame to insert a printed custom message to lighten the mood and get people smiling while attending a function in your new home. Do a Google search to find an existing template you like or just play around with fonts to create a message that’s totally unique, perhaps honouring a special guest or celebration. 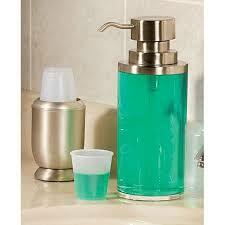 Mouthwash in the bathroom or powder room is an extra nice way of giving your guests some added hospitality while visiting your new home for a dinner party. You may not have a fancy dispenser readily available in which case you might want to consider using a tall glass oil dispenser with some shot glasses for rinsing. 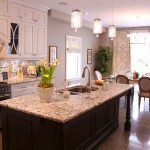 For more great lifestyle tips and design ideas for your new home, be sure to visit the Mosaik Homes Facebook Page!